My parents came to visit this weekend which this time of year means Christmas shopping. Yes, my Mom is one of those people that likes to be done with her shopping before Thanksgiving. She also likes for my sister or I to go along to give 2nd opinions (I always wonder if this is just so she can “blame” us if someone doesn’t like their gift!). 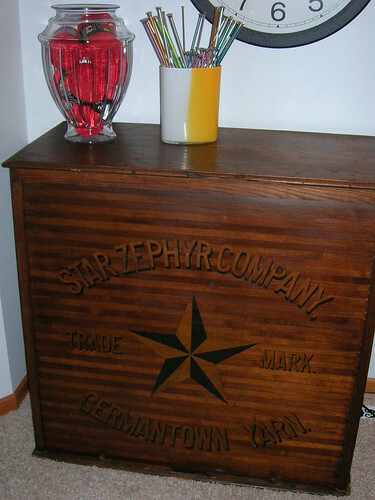 🙂 So there was shopping to be done, AND the long awaited yarn cabinet was delivered!! 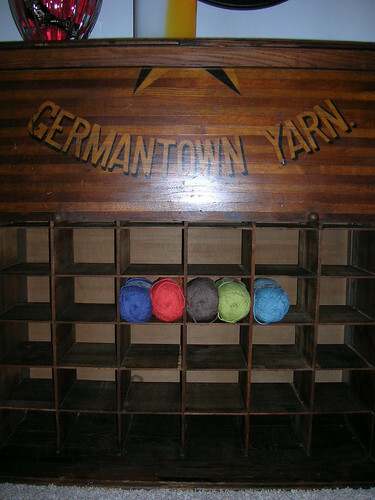 While at an antique show in June I found the coolest old yarn cabinet (originally a Germantown Yarn display for a store). Well, actually my Dad spotted it. He only pointed it out because I had said that my house is full and the only things I was looking for would be knitting related (honestly I thought they would be small items, if any!). 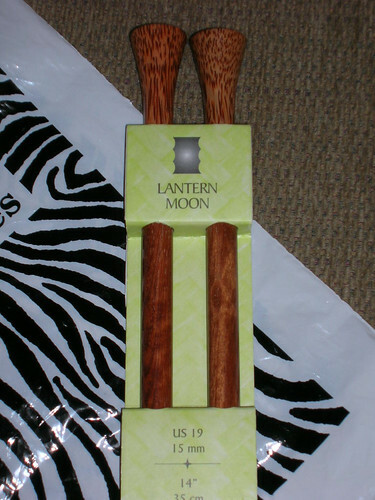 He was a little shocked when I got all excited, and proceeded to buy it….remember the “only wanting small items” part? Well, it was a typical purchase for me because it would not fit in my car! So it has been stored lovingly in my parents garage until they finally had time to haul it up here to me!! I was so excited that I haven’t even gotten it filled yet, but am totally loving it in my family room!! 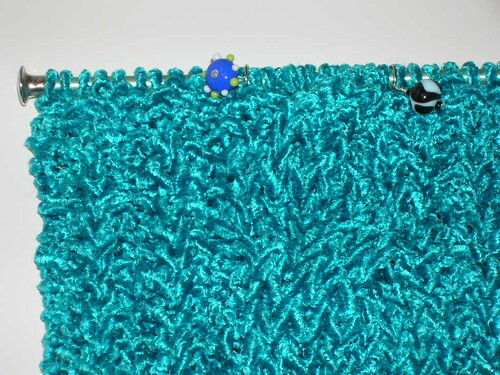 Also as an update on my Vintage Velvet scarf….it was a mistake that I had made and I frogged the thing. BUT have it started again and will make sure to pay more attention this time! 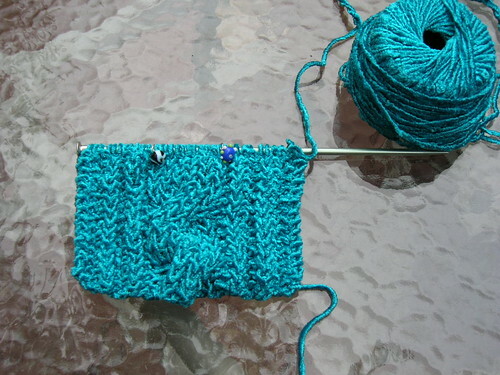 I’ve pretty much memorized the pattern now which means fewer mistakes when I work on it while watching a movie. I, unfortunately, did not get to visit a LYS while I was in the Carolinas. HOWEVER! 🙂 My good friend went to Chicago the same weekend, and visited a LYS for me! Yes, it was my birthday and she got me the best present…..
Not only did I love the fact that she got me big ol’ needles (19’s) to make my projects go so much faster, but I also loved the thought and effort involved as well. 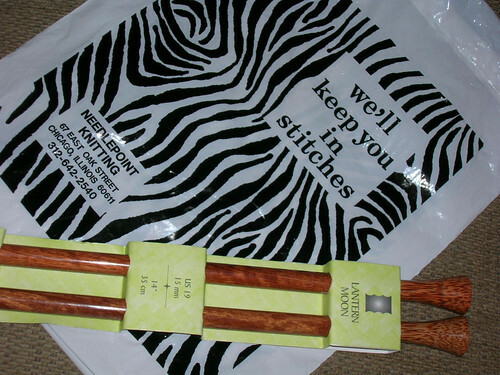 Her very patient, very sweet boyfriend knew that she wanted to get me something knitting related and grabbed the yellow pages, the map, and found the store (We’ll Keep You in Stitches) and went with her to pick out the needles. She said the place was run by 2 women and it appeared to have been there forever. Evidently a little small and chaotic, but very fun for me!!! We have been having truly crazy fall weather! Yesterday was in the 80’s and very humid. Today was downright brisk at lunchtime!! You can’t help but love MN in the fall! It’s always a surprise what you are going to get! I have seen many people’s pictures online, but it is truly amazing how the colors flow and the stripes are formed. Similar to our crazy weather this yarn is a surprise in my not knowing how the stripes will appear and blend together. Luckily Noro knows more than me and it works beautifully! 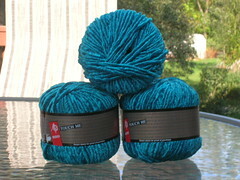 The yarn (Silk Garden Lite) is a bit scratchy for me, but is truly pretty! I plan to add the finished product to my gift box. My gift box concept came into existence because I have been a fiend at knitting scarves….even in MN how many scarves can one person realistically wear?? I really must move on to sweaters or socks!! 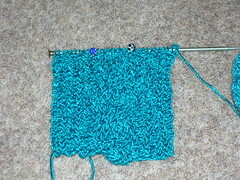 I thought I should show proof that I have been knitting….in fact this was our knitting night on Wednesday. We were laughing at how geeky we were as we took this picture for a far away knitting friend (knowing she would be jealous for missing out on all of our fun)! I have become queen of the self portraits, but have very rarely ventured into “timer” photos! 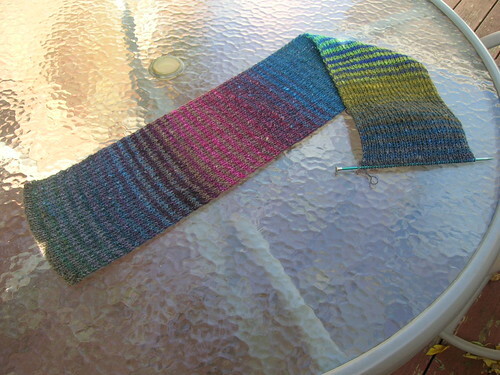 We did very well if I do say so myself…..and my Noro Striped Scarf is coming along nicely! I finally got my invite to Ravelry yesterday! 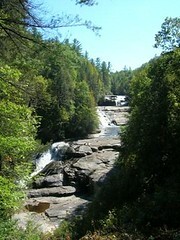 I have been busy playing in there instead of playing here! 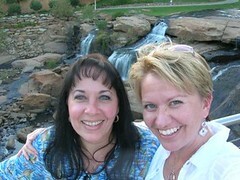 In addition to playing on Ravelry I have been visiting friends in far off places! As I think back on my most recent trip it also makes me think of the trip that changed my travel schedule this year. In January I went to visit a high school friend in Fort Worth, TX. It was the first time I had visited there, and other than the fact that the friend was a boy and is no longer in my life (big long ugly story there) I enjoyed my visit. The people were friendly and the food was great! We visited the quaint town of Salado and stayed at the Rose Mansion Bed & Breakfast. It was my first bed & breakfast experience and quite fun. I don’t think I’m cut out to be a regular bed & breakfast gal….but enjoyed it! The highlight of the trip for me was going to see the oldest Dr. Pepper bottling plant in Dublin, TX. I used to get glass bottles of Dr. Pepper out of the old fashioned pop machine when I was a kid and went to work with my Dad. It was fun to learn the history and drink the original formula! Our final touristy stop was the Fort Worth Stockyards. There is a lot of history there that made me feel like I had really experienced a small part of Texas. Following this trip I did a geeky thing and bought a laminated U.S. map for my office wall. I had (and still have) the urge to move and wanted a visual aid. I marked all of the places I have lived (only in the Midwest) and all of the places I have visited. I realized I am single, getting older, and really haven’t been as many places as I would have liked. So under the guise of finding where I would like to live next I have set the travel wheels in motion. Texas in January. Florida in March. New York City in April. Indianapolis in May. And most recently…North and South Carolina in October! We did a ton of catching up, and I didn’t get any of the knitting done that I had planned (I was really wanting to start the Touch Me Cable Scarf for my sister for Christmas). 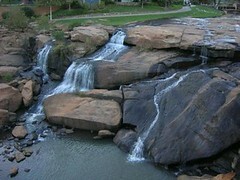 We did, however, go to Greenville, SC, where they have the most gorgeous park right in downtown!! 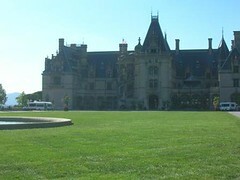 Then we made it to the Biltmore Estate in Ashville!! I had looked at it online, got a book, and everything I could do to be prepared. It was GORGEOUS!!! My little picture does not do it justice, but trust me it was gorgeous!!! HOWEVER!! I was travelling with 2 southerners, and I must say that sticking to a schedule is not a top priority for them (or at least the 2 I was with). We had a little over 1 hour to cover a 250 room mansion. Yes, too short, but better than nothing!! I am amazed that George Vanderbilt was able to build a mansion with 43 bathrooms (yes, indoor plumbing), electricity, AND central heating in the late 1800’s!! I am in awe, so I can’t imagine what the people back then thought! We finished our trip to Ashville off with dinner at Vincenzo’s Ristorante. It was fabulous! The food was excellent, the entertainment was great, and the owner was entertaining and personable. Now I am back at home doing laundry, playing on Ravelry, and trying to get some knitting done. Hopefully I will have some updates tomorrow!